There is a lot of talk in the water sector about the "value of water". We want the public to understand it — and pay for water's full cost, including collection, treatment, and delivery — but how many utilities really know the value of their own product? Would you ever think about branding it? Louisville Water Company did. Called Louisville pure tap®, it's the first and only utility-trademarked tap water. "When bottled water sales began rapidly rising in the 1990s, we wanted to send a message that Louisville’s tap water is just as good — actually, it’s even better — than the expensive, less-regulated bottled products," the utility explains. You can find the logo on water bottles, cups, and coolers throughout Louisville, served in restaurants, businesses, and at community events. 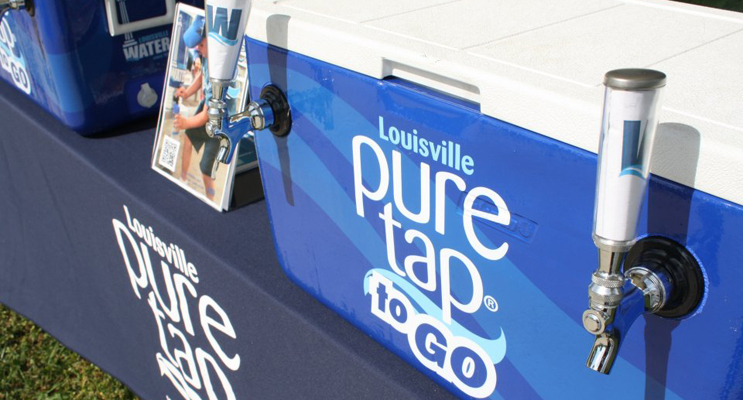 Proving just how far ahead Louisville Water is on showcasing the “value of water” to its community, the utility celebrates 21 years of Louisville pure tap® in 2018, with events during Drinking Water Week. Of course, you have to produce high-quality, great-tasting drinking water to be so bold. The work comes before the pride, and the pride is not unfounded. Louisville Water’s Crescent Hill Filtration Plant is one of just 16 plants in North America earn the Partnership for Safe Water’s Phase IV “Excellence in Water Treatment” Award, claimed in 2015. Furthermore, Louisville Water is one of only two utilities to have multiple plants win the prestigious award, with its B.E. Payne Water Treatment plant honored in 2010. It starts at the source — the Ohio River. Louisville Water Company is lucky in that they use just 1 percent of the river’s flow on a daily basis, so volume is no issue, but the utility sought to innovate and improve the way they draw from the source. The result was the Riverbank Filtration Project, the largest collector well project in North America and the first in the world to combine a gravity tunnel with wells. Completed in late 2010, the tunnel is 1.5 miles long and 150 feet below the surface, running parallel with the river. Four wells collect water from above and send it through the tunnel to the B.E. Payne plant. Because it’s a cleaner source, far from surface water pollutants and aided by sand and gravel filtering of microbial contaminants, the water requires less treatment and is thus a greener process. Treatment also gets a boost from the consistent water temperature — roughly 55 degrees — compared to Ohio River surface water temperature that fluctuates from freezing to 80 degrees and could wreak havoc on pipelines. In the end — at the tap — the $55-million endeavor has paid off, delivering award-winning water quality for Louisville Water consumers. The utility has also earned recognition for the project itself, receiving the “Outstanding Civil Engineering Achievement Award” from the American Society of Civil Engineers in 2011. A hallmark of innovative thinking is an eye toward the future, and Louisville Water Company is ready for it. The utility says it can double its daily production almost instantly, providing enough reserve capacity to supply 35 automotive manufacturing plants. Although a hypothetical, it speaks to Louisville Water’s commitment to community sustainability and water resource sustainability — which happen to be two of the 10 attributes of Effective Utility Management (a closer look would reveal that Louisville Water displays all 10). This performance benchmarking framework is utilized by Louisville Water for financial, facilities, and capital improvement planning, and was instrumental in the utility receiving the Sustainable Water Utility Management Award from the Association of Metropolitan Water Agencies in 2016. Great work deserves such recognition, and awards help publicize efforts that might otherwise go overlooked. Part of solving the “value of water” problem as it relates to the public is asserting the value of utilities, and the very best utilities — by their outreach and impact — refuse to go unnoticed.